Welcome to the website of the Hispanic-American Evangelical Church of Appleton, WI, USA. We are very honored by your visit to our site, and we hope to be a useful instrument in God's hands in your spiritual life. We hope that the content and materials that you find here may impact your life with the help of the Holy Spirit so that you may come to a knowledge of the truth and experience a personal meeting with Jesus Christ, the only Lord and Savior. We are thankful to God for the opportunity that He has given us to use this means of communication for proclaiming the gospel of Jesus Christ and giving testimony to what God is doing among us. 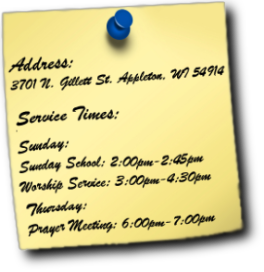 We want to cordially invite you to visit us and to be part of this community of faith in the Fox Valley.